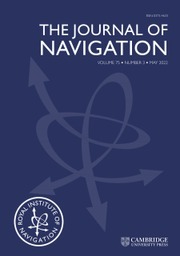 The Journal of Navigation contains original papers on the science of navigation by man and animals over land and sea and through air and space, including papers presented at meetings of the RIN, and from its special interest groups and other organisations associated with navigation. Papers cover every aspect of navigation, from the highly technical to the descriptive and historical. Subjects include electronics, astronomy, mathematics, cartography, command and control, psychology and zoology, operational research, risk analysis, theoretical physics, operation in hostile environments, instrumentation, ergonomics, financial planning and law.